(1993) Do You Want More?!!!??! Singles from Do You Want More?!!!??! Do You Want More?!!!??! 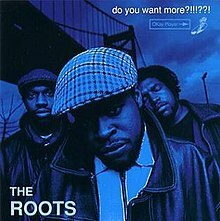 is the second studio album by American hip hop band The Roots, released January 17, 1995 on DGC Records. The band's major label-debut, it was released two years after their independent debut album, Organix (1993). Do You Want More?!!!??! has been considered by critics as a classic of hip hop jazz. In 1998, the album was selected as one of The Source's 100 Best Rap Albums. On November 2, 2015, twenty years after its release, the album was certified Gold by the Recording Industry Association of America for shipments of 500,000 units in the United States. ^ Bush, John. "Do You Want More?!!!??! – The Roots". AllMusic. Retrieved October 20, 2009. ^ Kot, Greg (March 23, 1995). "The Roots: Do You Want More?!!!??! (DGC)". Chicago Tribune. Retrieved August 19, 2016. ^ Hopkins, Tracy E. (January 20, 1995). "Do You Want More?!!!??!". Entertainment Weekly. Retrieved August 19, 2016. ^ "The Roots: Do You Want More?!!!??!". NME: 44. November 12, 1994. ^ Moon, Tom (2004). "The Roots". In Brackett, Nathan; Hoard, Christian (eds.). The New Rolling Stone Album Guide (4th ed.). Simon & Schuster. pp. 702–03. ISBN 0-7432-0169-8. ^ "The Roots: Do You Want More?!!!??!". The Source (62): 97. November 1994. ^ Aaron, Charles (June 2008). "Discography: ?uestlove". Spin. 24 (6): 88. Retrieved August 19, 2016. ^ "Do You Want More?!!!??! — The Roots". TheRoots.com. Archived from the original on 2014-07-26. Retrieved 28 Jun 2014. ^ Anderson, Brett. "Do You Want More?!!!??!". Yahoo! Music. Archived from the original on July 18, 2011. Retrieved October 20, 2009. ^ "RIAA – Searchable Database: The Roots". Recording Industry Association of America. Retrieved June 18, 2017. ^ "The Roots Chart History (Billboard 200)". Billboard. Retrieved September 18, 2013. ^ "The Roots Chart History (Top R&B/Hip-Hop Albums)". Billboard. Retrieved September 19, 2013. ^ "The Roots Chart History (Heatseekers Albums)". Billboard. Retrieved September 19, 2013. Colin Larkin (2002). Virgin Encyclopedia of Popular Music. Edition 4. Virgin Books. ISBN 1-85227-923-0. Back to the Roots at Jam!